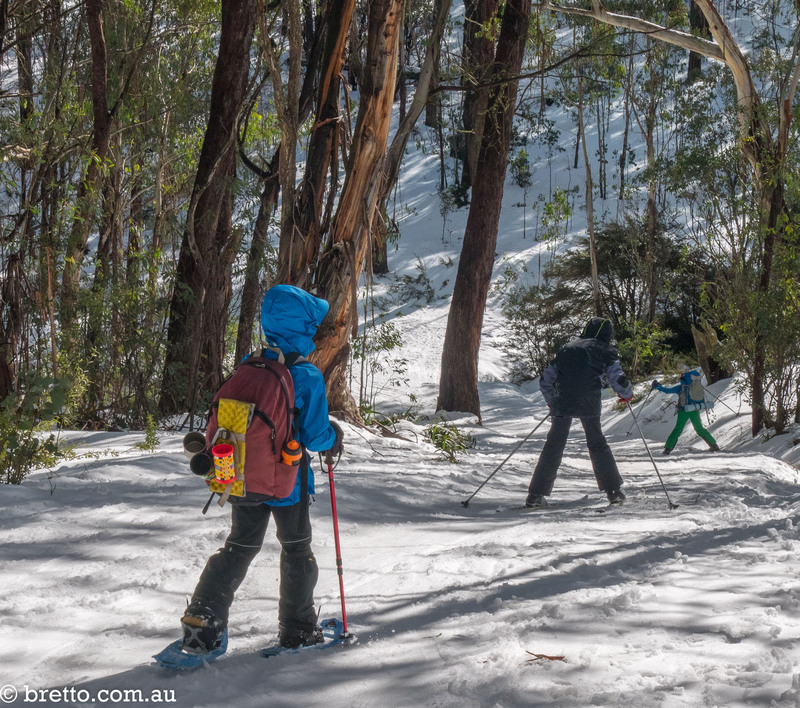 The winter of 2016 hasn’t been kind to Mt St Gwinear (my closest mountain) so for our annual kids trip it was time to explore new ground. 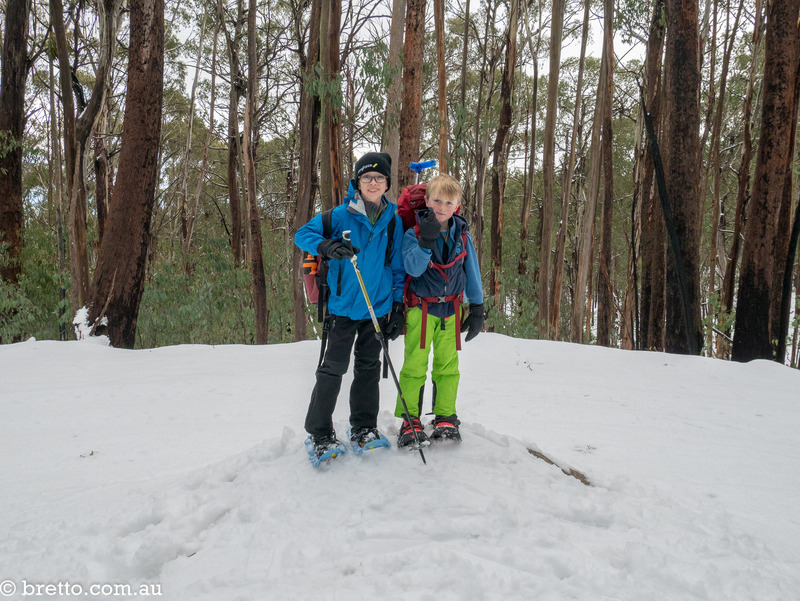 So we decided to head up to Mt Stirling – the cross country cousin of Victoria’s Mt Buller. In addition to the usual suspects my boy decided to join us for the first time as well as my mate James and his 3 youngsters. So we ended up with 3 dads and 7 kids this year. 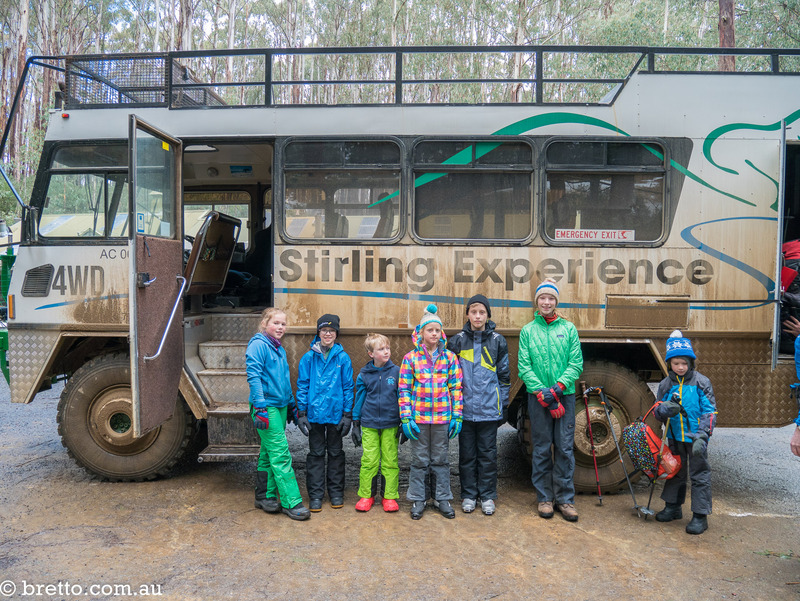 Having never been to Stirling in winter I was keen to get some local advice and Craig from http://www.stirlingexperience.com.au/ was very helpful with tips on where to go and where to camp noting the relatively short distances that kids can cover. 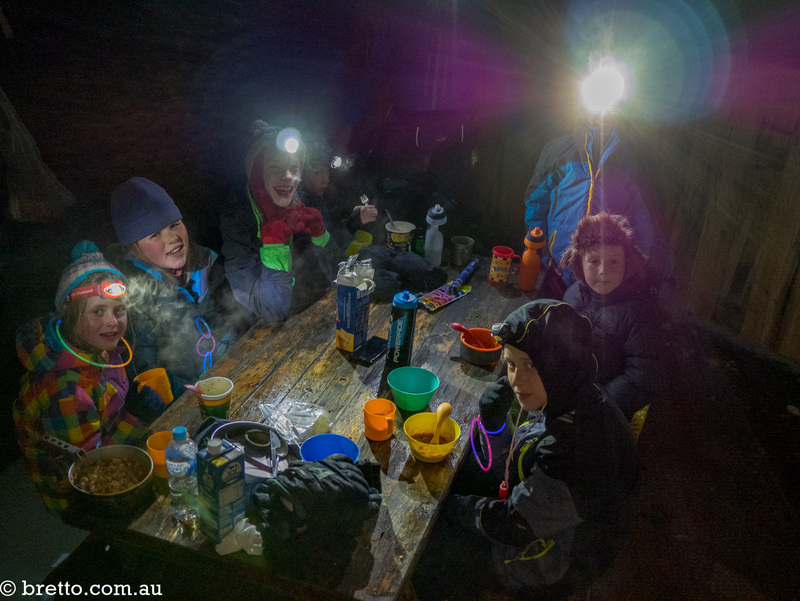 We went in mid August and it was about 2km to get to the snow from the car park at Telephone Box Junction (TBJ) so we decided to get a ride to King Saddle shelter with Craig in the Unimog. 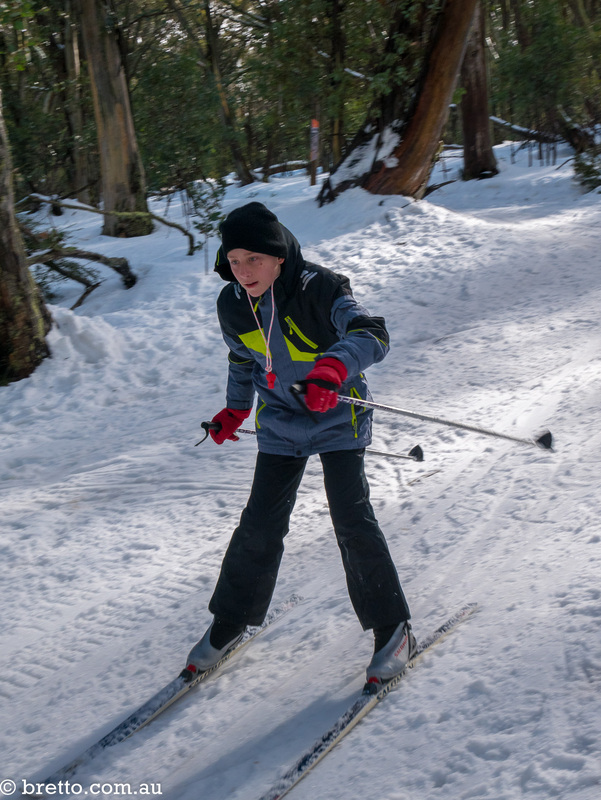 It wasn’t a tough decision……pay the small fee for the bus ride or listen to the kids complain about carrying their skis and walking in their ski boots. 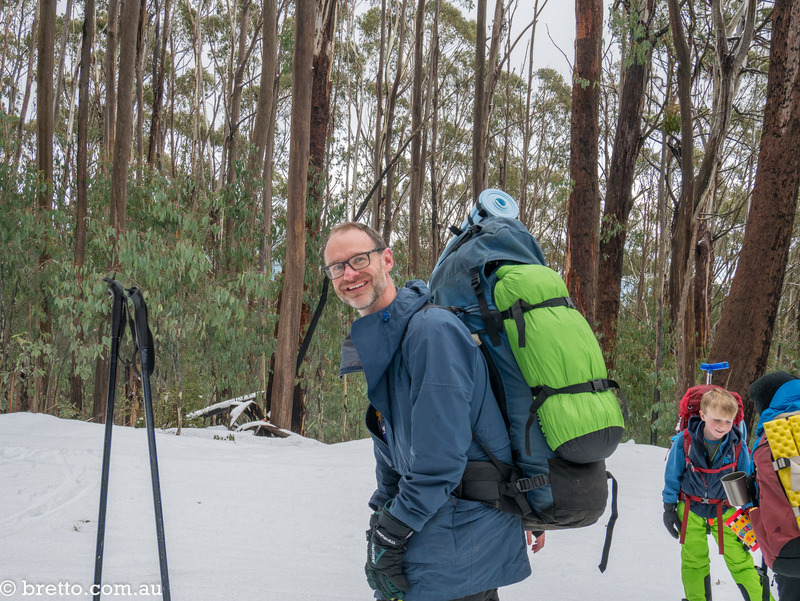 Once we had unloaded our mountain of gear and hit the snow everyone was happy. 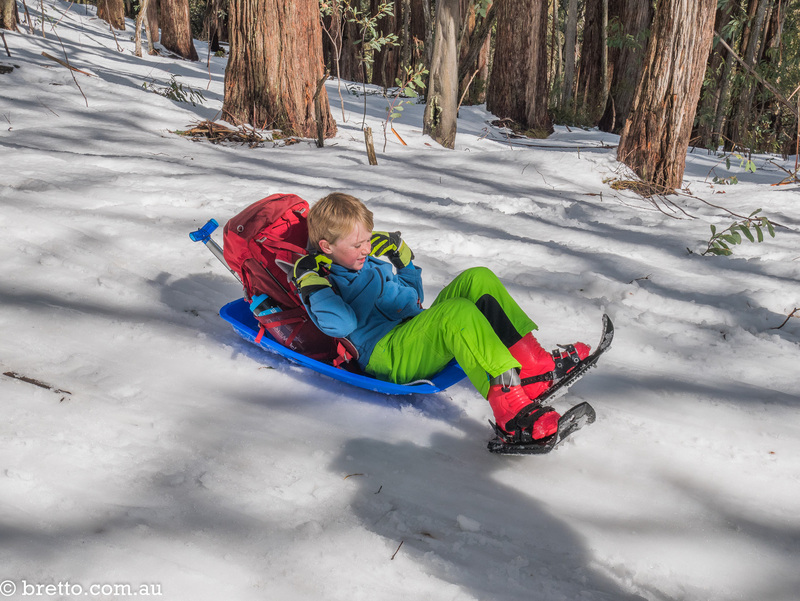 If you want to take your kids snow camping you will be carrying a heavy pack. It’s unavoidable until the kids are old enough to carry all their own gear. James and Audrey on the Fork Creek Trail. We camped at the appropriately named Machinery Shed. 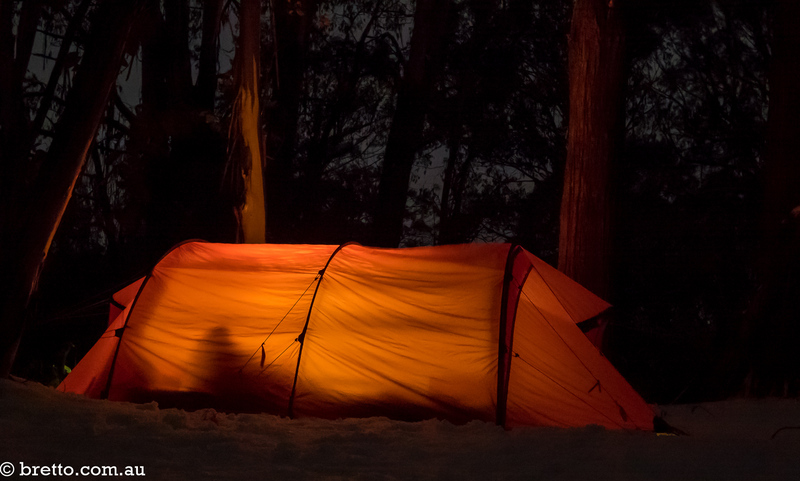 The distance was about right for our group: there was flat snow to camp on, a portable toilet and a picnic shelter. 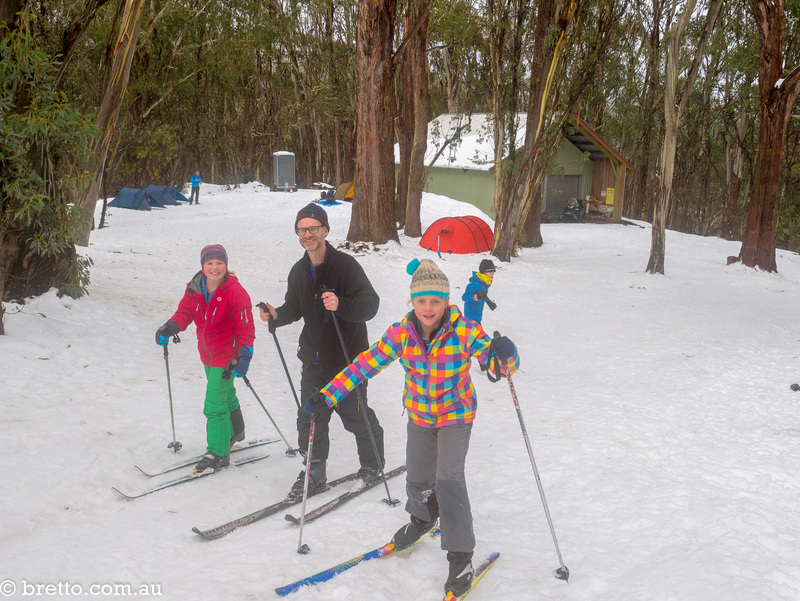 The best part was a nice ski slope running through the campsite which kept us all entertained for hours. 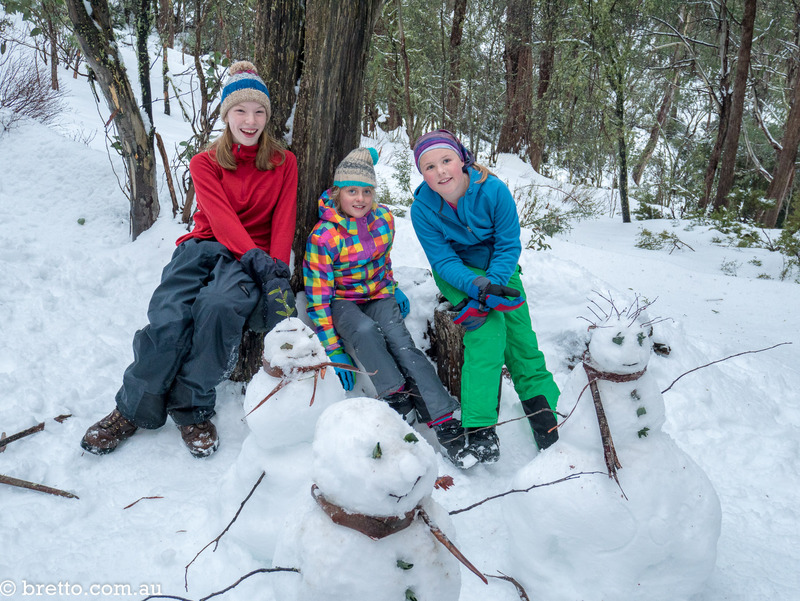 The girls decided to build some snowmen although I don’t understand why they had to go a two hundred metres through the bush and down a gully to find the spot to do it. SAFETY TIP: I make my kids carry a whistle and small torch at all times in the snow. The toboggan got a fair workout. The weather was really good but it was handy having a shelter with tables and chairs. HOT TIP: Take the kids for a brisk walk up a hill before bed time to make sure their hands and feet are all warmed up. This would have been a good photo of my Keron if I had tensioned the guy lines. A floppy tent isn’t a good look. 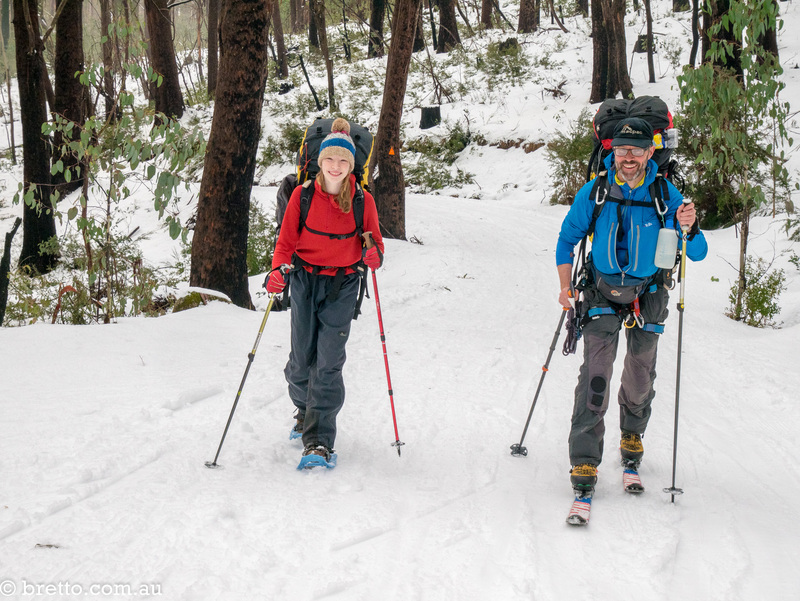 The weather was so nice on the second day that we hung around until after lunch before heading back to King Saddle. 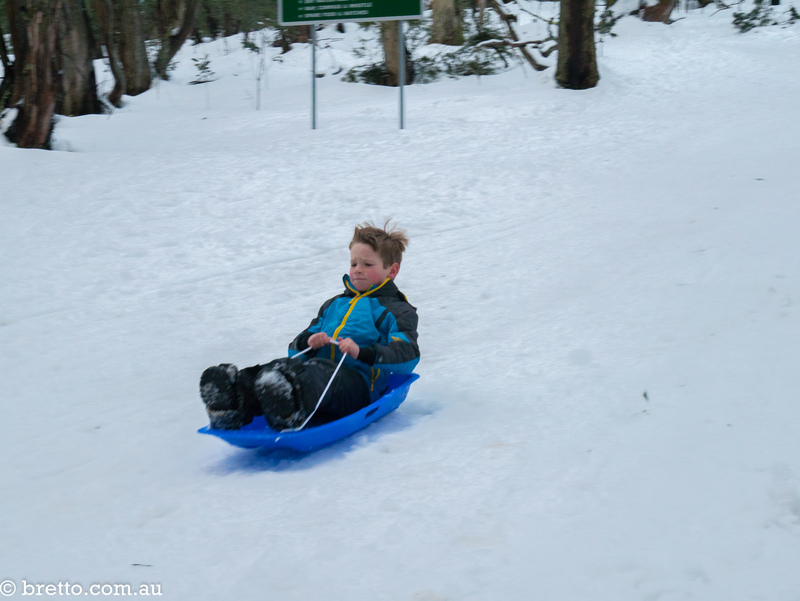 Fraser found out that tobogganing isn’t much fun on gently sloping snow. The Fork Creek Trail was about right for the skills of our group. Descending this small hill with a pack on was pushing the limit of my skiing skills. We met this very amusing guy…..let’s call him Alpine Party Man. He was on his way back from a party somewhere higher on the mountain with his home made sled and 19 litre steel beer keg! 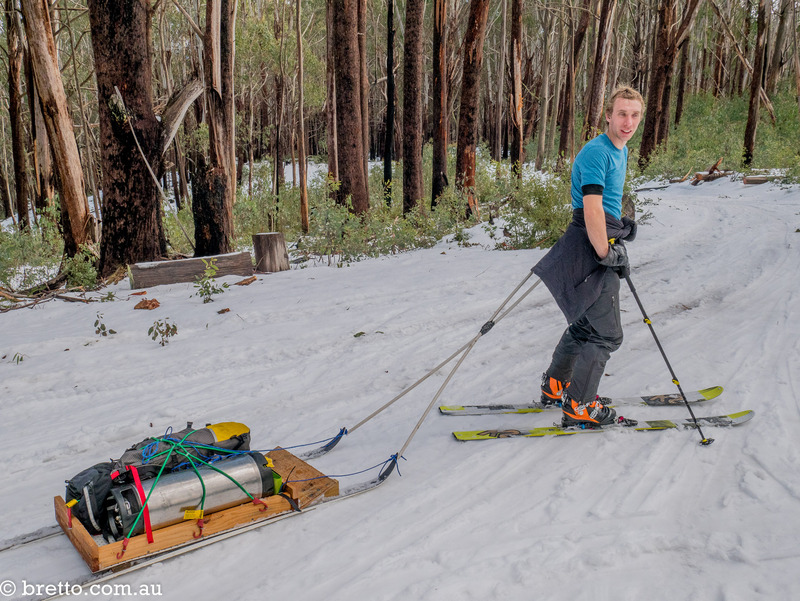 He said his sled weighed 55 kg on the way up the mountain so understandably they had to drink all the beer to keep the weight down for the return journey. That is serious commitment. 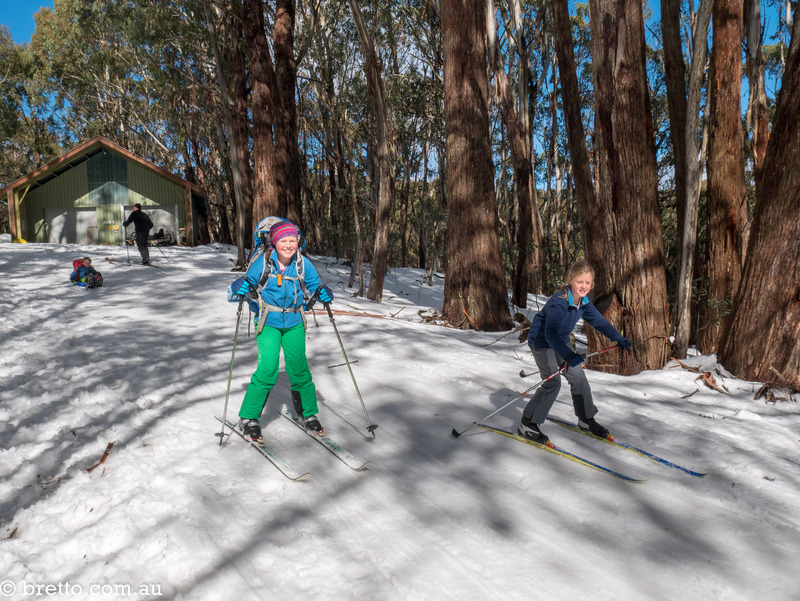 On a final note – when the sign says “Caution: Remove Skis here – patchy snow past this point” do you think these 4 geniuses would pay attention? No way. 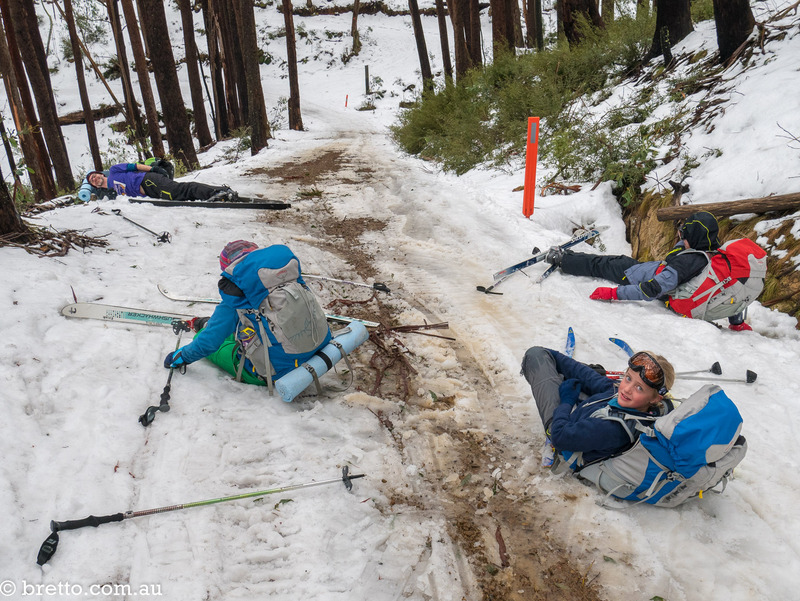 They got to ski for another 100 metres before ending up like this.